Joint personnel from Satpol PP, PPSU, and North Jakarta Water Resources (SDA) Sub-Dept. personnel dismantled eight illegal buildings above water channel on Salon Alley at RT 05/03, Sukapura Urban Village, Cilincing.
" 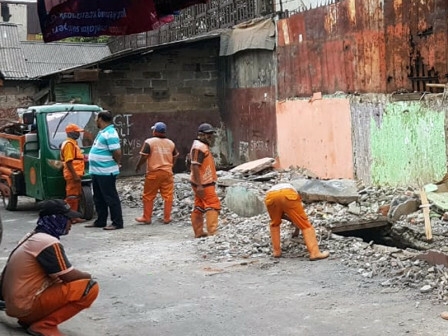 After dismantling it, North Jakarta SDA personnel will normalize the channel"
Sukapura Urban Village Head, Tri Budianto said, those buildings covered and hampered the water flow of this channel thus it couldn't functioned normally. "After dismantling it, North Jakarta SDA personnel will normalize the channel," he stated, Wednesday (8/8). Previously, he continued, his side gave socialization, warning, and then instructed owners to dismantle it. Thus building owners are supposed to know that their buildings are violating the rules and need to be dismantled. "There is only one building owner who are willing to dismantle its own building. We give them one day to dismantle it," he conveyed.